Have you ever had a cervical cancer scare? I owe my life to prevention screening – Well Woman exams. There is a lot to know about cervical cancer so we are going offer the cliff notes right here, right now, so that none of us becomes a statistic. The great news about cervical cancer is that it is known what causes it, is one of the most preventable cancers for women, and is on a steady decline. The way you can prevent it, as I did, is by being vigilant with your intimate, reproductive and women’s health. 1. Timing: We have been conditioned to begin pelvic exams annually starting at age 18. Updated guidelines, according to www.cancer.gov suggest that “women ages 21 through 29 should be screened with a Pap test every 3 years. Women ages 30 through 65 can then be screened every 5 years with Pap and HPV (human papillomavirus) co-testing, or every 3 years with a Pap test alone.” If you have an abnormal Pap or positive HPV result, you and your physician will decide on next steps. Another HPV test that specifically looks for types, 16 and 18, the two that are known to cause most cervical cancer. A biopsy of the cervix to test the cells appearing abnormal. Wait and see approach with more frequent screenings. 2. 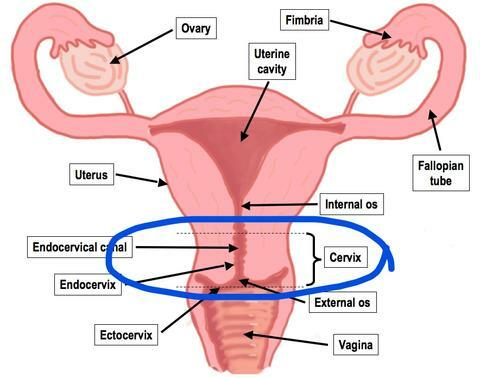 What causes Cervical Cancer? HPV or human papillomavirus is found in about 99% of cervical cancers. HPV-16 and HPV-18 are the biggest culprits. Screening = prevention, because when caught early, steps to mitigate it can be taken; the details of which you would discuss with your health care provider. Smoking is also a cervical cancer risk factor. Nicotine likes hanging out in that tissue so a great reason young women should never start smoking. If you ever experience these symptoms, don’t freak out, simply consult your Ob-Gyn. Your body may be telling you something is amiss. Also, if you have multiple sexual partners, get screened for HPV and other STDs on a more regular basis. A comforting note about HPV – though it is a sexually transmitted virus, many forms of it resolve within 2 years and most types don’t lead to cervical cancer. Also, over 80% of women by age of 50 have had some form of HPV. It is ridiculously common. Please share this with women you know who need a nudge to better self-care. Leave us a comment below or send us questions you have. To dig deeper, read these sites. Great post !! Thanks for putting this up it’s very informative.Keep writing.